Taxi Paris : How to book a cab in Paris ? How to book a Taxi in Paris ? - "VTC" (stands for Véhicule de Tourisme avec Chauffeur) are the equivalent of Uber, Lyft or Addison Lee minicabs. They do not have a distinct sign as taxis, but the must hold a licence to operate as private drivers. This licence must be visible on the windshield. 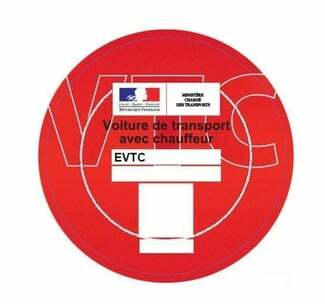 There are c. 18 000 taxis and 25 000 VTC in Paris and suburban area. As a client, you can order a Taxi or a VTC if you require a ride. 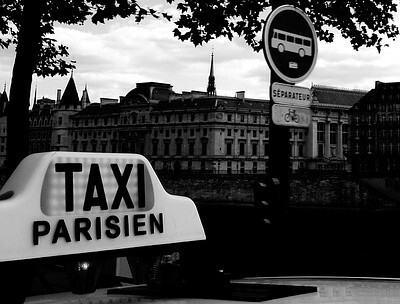 There are around 18 000 taxi drivers in Paris. For many years, taxis have enjoyed a monopoly on passenger transport. Taxis as we know them came into being in 1937, with the introduction of a numerus clausus and the introduction of regulated prices. Supplement for a 4th passenger : 3 €. Extra charge for one piece of luggage : 1 €. 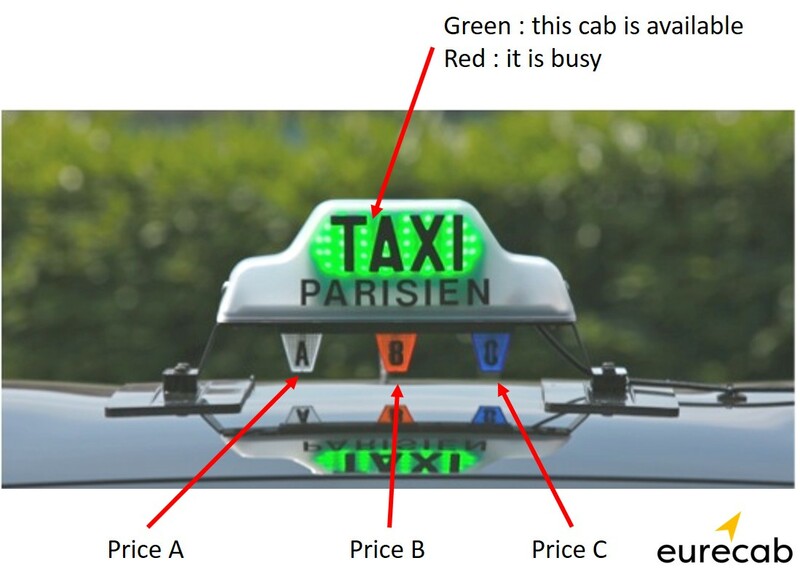 How to order a cab in Paris ? In Paris, you can simply hail a cab. This is the most convenient way. Just find a taxi with a green roof sign and hail it ! Once in the car, ask the driver to put the meter on (be firm about it). The meter looks like a taxi meter, a specific device fixed on the car dashboard. If the meter is an app on the driver's phone, beware, this can be a scam for tourists. There are fixed price for airports. Between Roissy and Paris it costs €50-€55, and between Orly and Paris it costs between €30 and €35. Second option, you can order a cab thanks to a taxi app. Please be aware that additional cost may incur for approach (between €4 and €7 in Paris, more in suburb). In Paris, the mot popular app for Taxis is G7. How to read the Taxi roof sign ? Unlike VTC, taxis can be hailed in the street in Paris like almost anywhere in the world. Nevertheless, one should look at the Taxi roof sign before hailing a cab. Basically : the roof signs provides two informations : Price, and availability. Letter A : €1.06/km + 32,10 €/h when iddle. This is the cheapest price, usually from monday to friday between 7am and 7pm. Letter B : €1,32/km + 39,02 €/h when iddle. This is the intermediary price, usually from monday to friday before 7am and after 7pm. Letter C : €1,56/km + 35,80 €/h when iddle. This price applies on sundays or public holiday. So before getting in the car, check the sign on the roof : it indicates the current price. This one is easy : if the roof sign is green, the taxi is available and you can hail it. If it is red, then somebody is already in the car or the taxi is on his way to pickup a customer. Beware no taxi is allowed to pickup clients in immediate vicinity of stations or airports. There is a queue for that. If you hail a cab in front of a station, it will not stop. Which one is the cheapest : Uber or the Taxi ? So just remind taking an Uber or a regular cab in then street (no pre booked) costs roughly the same price when both are at the lowest price. Where to find a taxi in Paris ? Find one in the street. Go to main streets, ideally crossings to improve your chances. Call a cab. Here are the two main operators in Paris : Taxi G7 and Alpha Taxis. Additionnal costs may apply. Always prefer the taxi hailed in the street if you want to pay less.